Katherine McHugh is Executive Director of the Cabot Family Charitable Trust, a post she has held since 2008. Previously, she served as the Director of Program Development for MassINC, a statewide nonprofit research and policy organization focusing on the welfare of the state’s middle class. In addition, she brings many years of philanthropic experience from her position as Program Director and education specialist for the Jessie B. Cox Charitable Trust, a New England-wide family philanthropy, in which she served for 12 years. Ms. McHugh is trained as a lawyer and practiced for many years before turning to philanthropy in 1992. She is a trustee and vice chair of the Board of Northeastern University and received an honorary degree from the university in May of 2008. She is also a former chair of the Associated Grant Makers board, the Boston Education Funders group, and the Boston Schoolyard Funders Collaborative. 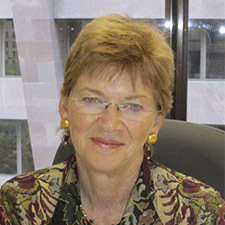 She participated in the founding of EdVestors in 2001 and has been a board member since its inception, chairing the board for three years from 2010 to 2013.